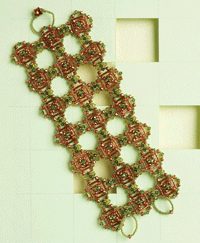 Kelli Burns’ Tuscan Tiles bracelet is a beautiful, stylish way to use copper bugle beads. When I first started learning how to bead, I only thought of using bugle beads as fringe for the dozens of peyote stitch amulet bags that I made. Later, I started experimenting with using bugle beads for things like bracelet making, and as a way to make quick and beautiful netted collars. Bugle beads weren’t easy to find, and when I did find them, the range of colors was quite limited. Now that I know my way around a bead shop (and around the internet), bugle beads are a lot easier to come by, and in a lot more colors and styles. You can even find bugle beads made with precious metals like sterling silver and gold-filled, and base metals like brass and copper. 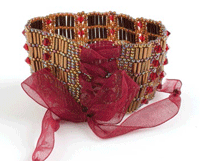 The Swingin’ Bugle Cuff by Cathi Tessier is a classic retro bugle bead bracelet! This is the kind of bugle bead bracelet making project that I love to work with, because you can play with colors to your heart’s content. Experiment with new colors, twisted bugle beads, or even metal bugle beads to make a beaded bracelet that you can wear with anything and everything. You have to look very closely at Smadar Grossman’s Wheels of Fortune bracelet. The bugle beads used in this particular bracelet making design are used so that they blend in perfectly with the matte metallic cube beads used to create each circular wheel! The wonderful circular shape of each wheel is the perfect contrast to the “straight and narrow” of the bugle beads, don’t you think? Fit for a princess? Oh, yes! 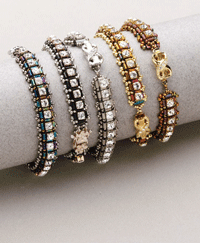 Cristie Prince’s Princess Kate Bracelet makes easy and elegant use of chain made with prong-set crystals. 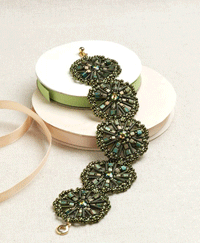 Add a rhinestone clasp, and you’ve got a quick and easy bracelet making project that looks like it came from a high-end department store jewelry department! Make a whole armful when you want to look like a million bucks without spending the family fortune. Csilla Csirmaz’s Corset Cuff allows the bugle beads to take center stage, accenting them with sparkling crystal beads and finished with a very clever ribbon-tie closure. The soft, gauzy ribbon and sparkling crystal beads give the bugle beads used in this bracelet making project a kind of understated elegance that just brings out the romantic in me. After all these years, I still can’t figure out what it is about bugle beads that I love so much! They’re great for adding a unique texture to my bead embroidery pieces, and using them for bead-weaving is a fantastic challenge for my design skills. With all the bugle beads that keep finding their way into my bead stash, I’m just going to have to keep looking for great beading and bracelet making projects like these to use them all up. If you love using bugle beads, take a look at Stitching with Shaped Seed Beads: 10 Beaded Projects to Make with Bugle Beads. For less than a dollar per project, you can instantly download ten innovative bracelet making and necklace making projects that use bugle beads. Learn how to use bugle beads to create bezels for your favorite crystal stones, mix them with crystal beads, and learn about color play using your favorite seed beads. 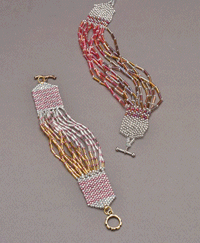 Do you have a favorite tip for working with bugle beads? Leave a comment here on the Beading Daily blog and share it with us!